A Nature Communications paper on the coupled river-subsurface ecosystem describes new insights into the dynamics of mixing groundwater and river water and its biogeochemical and microbial effects. Researchers working with James Stegen install monitoring gear in a hyporheic zone along the Columbia River. A new Nature Communications paper appeared Thursday (Feb. 8), written by authors largely from the Pacific Northwest National Laboratory (PNNL), and led by PNNL ecologist James C. Stegen. It proposes a novel four-part thermodynamic mechanism they say underlies stimulated biogeochemical activity in the hyporheic zone. Hyporheic zones are within river corridor ecosystems across the world, and represent a dynamic continuum where groundwater (GW) and river water (RW) mix. This mixing stimulates biogeochemical activity, giving it a strong influence over the transformation of organic matter, nutrients, and contaminants. Importantly, that influence includes the conversion of dissolved organic carbon (DOC) into carbon dioxide (CO2). All this means hyporheic zones are ecologically and biogeochemically consequential. But the mechanisms that stimulate their biogeochemical activity are still poorly understood. To date, there is no full accounting of the mechanisms that prompt and control the biogeochemical impacts of GW-RW mixing. This weakens the present utility of process-based models built to predict the impacts of environmental change on river corridor ecosystems. The new paper helps resolve this shortcoming by improving our understanding of the mechanisms governing DOC transformations and provides a new way to conceptualize the role of thermodynamics. Its findings also provide a way to customize modeling frameworks for these types of systems, and will ultimately lead to improved predictions of how ecosystems respond to environmental change. A key challenge to improving predictive models is linking fine-scale processes (such as microbial activity) with larger-scale phenomena (such as the seasonal and dam-controlled pulses of GW-RW mixing). One mechanism commonly thought to enhance the biogeochemical impacts of GW-RW mixing activity is how electron donors (like organic carbon) join with electron acceptors (like oxygen). This joining results in the well-known phenomenon of biogeochemical "hotspots." Individual molecules of DOC found in GW are more thermodynamically favorable for microbial transformation to CO2. Low DOC concentrations in GW protect these thermodynamically favorable DOC molecules. The low amount of total energy available suppresses microbial transformation of DOC. DOC in RW is at higher concentrations, but each DOC molecule is less thermodynamically favorable for microbial transformation. This lower favorability protects DOC molecules in RW from microbial use. GW-RW mixing stimulates the transformation of DOC to CO2 by combining GW's low-concentration, but more favorable DOC, with RW DOC that is higher-concentration but less favorable for microbial transformation. Such thermodynamic mechanisms regulated by GW-RW mixing are recognized here for the first time. They may strongly influence biogeochemical and microbial dynamics in river corridor ecosystems. 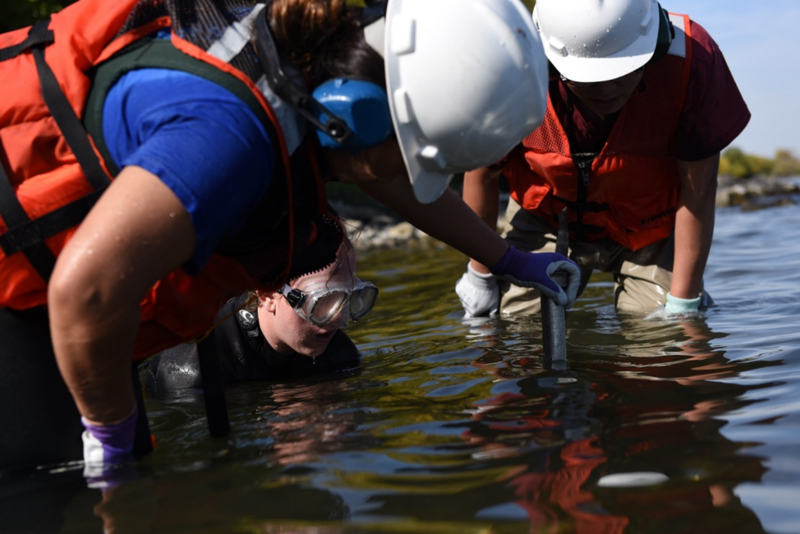 To arrive at these mechanisms, for seven months the research team sampled GW and RW from 10 wells, a near-shore piezometer, and the river itself along 400 meters of the Columbia River in the Hanford 300 area in southeastern Washington State. These mechanisms are particularly relevant to systems like the Hanford Site where there is oxygen in both the river water and in the adjacent groundwater. In these types of systems, classic paradigms do not apply, undermining our ability to properly represent underlying mechanisms within predictive modeling frameworks. The researchers observed that mixing removes the protection mechanisms for both GW and RW, but only across a narrow range of mixing conditions. If there is more than 10 percent GW, the stimulation is lost. At that level of GW contribution, the DOC concentration falls to a level that may be low enough that microbes cannot transform the DOC present there. Intriguingly, the same concentration was found to limit microbial use of DOC in the deep sea, suggesting a universal mechanism could be at work. The idea that DOC transformations are regulated by a defined threshold, apparent in both the hyporheic zone and in the deep sea, could be a starting point for future experiments designed to reveal deeper mechanisms. Meanwhile, the authors hypothesize that the more favorable DOC in GW may be related to elevated methane concentrations in sediments, as well as to leachate from buried organic carbon derived from deposits of woody material. The authors tested their thermodynamics-based hypothesis using high-resolution profiles of DOC samples via Fourier transform ion cyclotron resonance mass spectrometry (FTICR-MS) at the Environmental Molecular Sciences Laboratory (EMSL), a U.S. Department of Energy science user facility located on the PNNL campus. This investigation, it turns out, opened up major opportunities for other researchers. The research team is currently working with EMSL scientists to push the boundaries even further. The project "asked interesting questions but needed 544 samples to be run and analyzed," said Rosalie K. Chu, a research ecologist at EMSL. "We were not going to hand-inject that many samples. So we had to build a direct infusion cart to accommodate the study and then write code to analyze all the data that was collected." EMSL's Nikola Tolic and Malak Tfaily wrote and integrated the code to calibrate, align and "to start to make sense of all that data," said Chu, who with Daniel Orton converted a proteomics liquid chromatography device into a direct infusion cart. In the field, researchers used time-lapse electrical resistivity tomography (ERT) across the broader groundwater aquifer to examine the larger-scale implications of stimulating DOC transformations by GW-RW mixing. They deployed an array of 352 electrodes divided into 11 lines, spaced about 25 meters apart. ERT produced 4-dimensional images of changes in electrical conductivity throughout the aquifer. Once translated into GW-RW mixing and DOC concentrations, the images indicated that stimulated transformations of DOC from GW-RW mixing prevented DOC from penetrating into the broader aquifer. This dynamic has significant effects on the biogeochemical function of the broader aquifer system. Researchers also found further links between ecological drivers of microbiome composition and DOC biochemistry, highlighting critical feedbacks among hydrology, DOC biochemistry, and microbial ecology. In all, the paper provides a new thermodynamically-based conceptualization of how GW-RW mixing influences the biogeochemical function of hyporheic zones and groundwater aquifers, which are critical components of broader river corridor ecosystems. Presently, the research team is building this new conceptualization into process-based models, which will be used to predict the impacts of environmental change on river corridor hydro-biogeochemistry. Sponsors: The Department of Energy's Office of Science, Office of Biological and Environmental Research, supported this research as part of the Subsurface Biogeochemical Research Program's Scientific Focus Area (SFA) at PNNL. User Facility: The Environmental Molecular Sciences Laboratory (EMSL), a U.S. Department of Energy Office of Science user facility located on the campus of the Pacific Northwest National Laboratory. Research Team: James C. Stegen, Tim Johnson, James K. Fredrickson, Allan E. Konopka, William C. Nelson, Evan V. Arntzen, William B. Chrisler, Rosalie K. Chu, Sarah J. Fansler, Emily B. Graham, David W. Kennedy, Charles T. Resch, Malak Tfaily, and John Zachara (PNNL). Michael J. Wilkins (Ohio State University). Reference: J.C. Stegen, et al., "Influences of organic carbon speciation on hyporheic corridor biogeochemistry and microbial ecology." Nature Communications 585 (2018). DOI: 10.1038/s41467-018-02922-9.